Sakura Taisen 3 ~ Is Paris Burning? 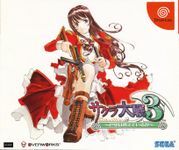 The third installment in Oji Horii's hit Sakura Wars, and the first Sakura Taisen for the Dreamcast. In Sakura Taisen 3, Oogami travels to Paris to take command of the Paris Bloom Attack Group in their fight against evil. The game abandons the eight female characters from the previous two games, and introduces five new. For this third game, the ground grid during the tactical combat was removed; instead the steam-powered "Koubu" robots could move freely on the terrain, and combo hits were introduced. The newest installation in the Sakura Taisen series is finally here! A new battle is about to begin, in the flowery capital of Paris!